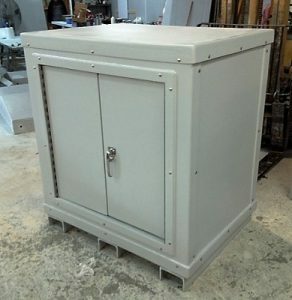 Since 1991, RM Products Ltd has been manufacturing pre-engineered modular fiberglass structures, buildings, enclosures, and cabinets. PRE-ENGINEERED: Building system is pre-engineered for wind and snow loads in North America. System is also rated as non-combustible. INTERIOR STRUCTURAL FLANGES: ​ Provide a convenient place to fasten or mount electrical boxes or cable clips for wiring. PORTABLE: Light weight yet high strength components. OPTIONS: Designed and manufactured for your Some of the options that we supply are: Doors, Fiberglass Doors and Awnings, Windows, Ice Rakes, Shelving, Anchors, Adjustable Jack Stands, Roof Hatches, Bollards and Ramps, Removable Fiberglass Panels, Lifting Eyes, Colours, Grating, Flooring, Fire Suppressant System. VIRTUALLY MAINTENANCE FREE: Fiberglass, UV protected. 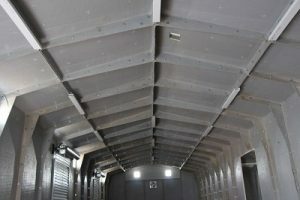 SHIPPING: Light weight and high strength modular design can be shipped in parts or pre-assembled with or without floors. 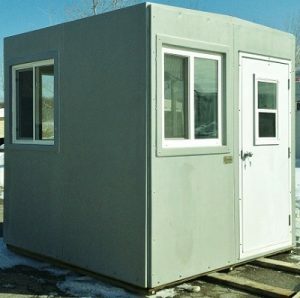 RM Products Ltd. fiberglass buildings have been used in many industries such as communications, containment, power, hydro and utilities, environmental, storage, schools, military, oil field, dock height warehouses and water/wastewater. 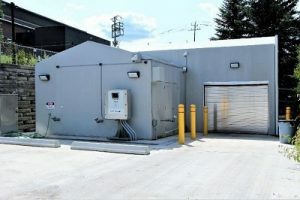 RM Products Ltd. fiberglass buildings are used for many different applications such as wastewater treatment equipment covers, chemical storage, wellhead shelters, ready to move buildings, RBC covers, injection well covers, storage buildings, equipment enclosures, chemical containment, odor control buildings, guardhouses, construction offices, screen covers, pumping stations, secondary treatment systems, army barracks, communications buildings, compressor rooms, septage receiving stations, generator covers and many more.